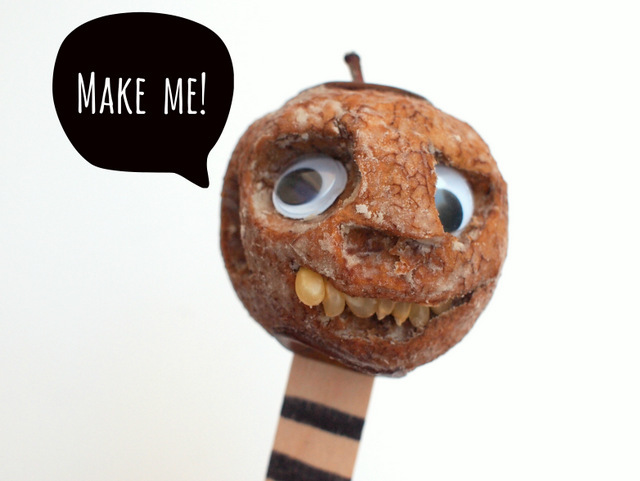 Easy and Spooky Shrunken Apple Heads! Do Halloween crafts rock your world? Yes!? Awesome. They totally rock mine too. Halloween is my favorite holiday of the year. Costumes, magic, candy, gross things, spooky things—I love it all! Tomorrow is the first day of October and I’m trying to squeeze in as many Halloween crafts as I can before the month is over. Today I’m sharing a really neat Halloween activity that also doubles as a STEAM (science, technology, engineering, art, and math) activity too. We’re making shrunken apple heads! 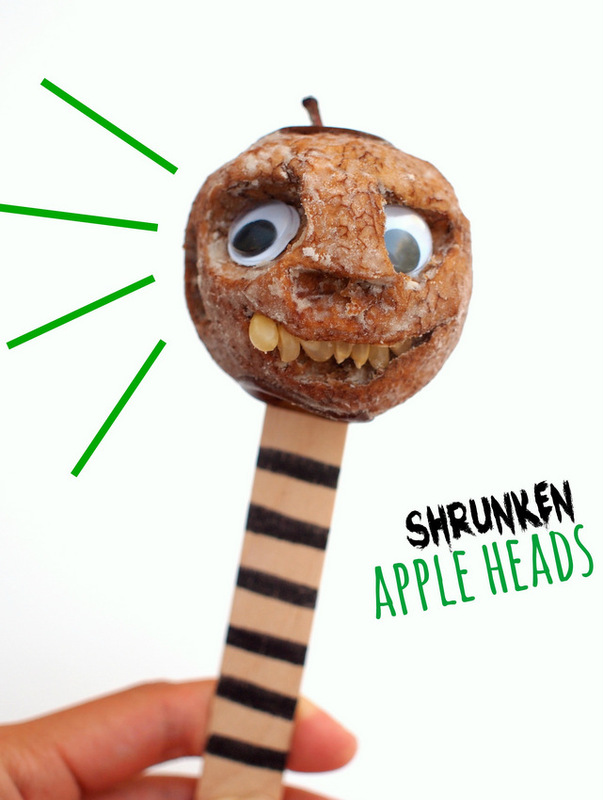 Have you ever tried making shrunken apple heads before? But I found this set of directions in an old Chickadee Magazine and modified it to fit our hot/ant-infested situation. And guess what? It worked! Now Let’s Shrink Some Apples! Step 3: (Optional) If you want your shrunken apple head to sit on a popsicle stick, take a stick and poke it in the bottom of your apple. Now you’ll have the perfect stick indentation for later. Step 4: In a large plastic bag combine ½ C of salt and 1 C of baking soda together. Mix them together well! Step 6: Leave the bag open and place it outside on the counter or in the fridge. (We left ours in the fridge.) Then, wait a week and see what happens! Step 7: Pull your apple out of the mixture. Dust off any excess baking soda and salt. What do you notice? What’s the same about the apple? What’s different? And, I’m sure this goes without saying, but please don’t eat your shrunken apple head. Whoa. Why does this work? The salt and the baking soda help the apple to shrink. They absorb the moisture and dry the apple out. They also prevent the apple from rotting and molding. Did you know the Egyptians used a similar method when they mummified their dead? Yup. They covered the bodies in powder to dry them out. Then, they wrapped them in linen. They did such a good job of drying them out, that the mummies bodies are still in great condition today! Why did you put your apple head in the fridge? The original directions said to leave the apple out somewhere at home. I’m sure this would have improved the appearance of our apple. They would have dried out much nicer. However, we have serious ant problems, so leaving food out just wasn’t an option for us. But, we were still able to see a change in the apple’s appearance and talk about that. I love this! Is there a way to extend this activity? Fridge vs. Outside: Try making 2 shrunken apple heads and leaving one in the fridge and one outside. Wait a week. What differences do you see? Does one location result in a dryer apple? Baking Soda and Salt vs. Naked Apple: Make 2 shrunken apples. Place on in the salt and baking soda mixture. Place the other out without covering it in anything. Wait a week. Compare the differences in the two apples. What makes for a better drying agent? Which one works better at drying the apple out: baking soda only, salt only, or a combination of the 2? I really love how our shrunken apple heads turned out. This was such an easy Halloween STEAM activity that got us creating together and talking about different scientific ideas. We’ll definitely be repeating it in the future! Looking for more awesome Halloween STEAM activities? Today’s your luck day, friend! Here are several other really neat ways to incorporate science, technology, engineering, art, and mathematics with Halloween!